Home » Canadian Millennials » Whole Foods – The Millennials’ Luxury Grocery Brand? Whole Foods – The Millennials’ Luxury Grocery Brand? I just read an interesting post on how Whole Foods became the luxury grocery brand for Millennials in the United States. I was recently down in Southern California and made a point of visiting a Whole Foods location. I had been before but after thinking about how and what Canadian grocers were doing to attract my generation into their stores, I thought a visit in person to the “wholy grail” of grocery stores in the US was worth an effort. For Whole Food customers, many of which are young professional Millennials, it’s all about the experience. The smell in the store, the way the store is organized, and how food is presented is so different than any other retailer. Going into Whole Foods is an experience in itself, a journey that reminds us why we love food. I’ll admit it – I’m a foodie. I love good food and good drink. But more importantly, I love to know not only where my food comes from how it was made. Whole Foods has been able to marry a love of food with a commitment to sustainable, locally grown food. And they have done this will charging a premium for the products and the experience. This marriage is a recipe for success among Millennials who seek customization and experience in all their retail experiences. If I can’t purchase my food online, I want my trip to the grocery store to be a full experience and I want to leave the store feeling good about myself. Whole Foods accomplishes that. In Canada, Whole Foods has entered the market, albeit quite slowly. With Loblaw dominating the market, rapid expansion will be difficult. However, plans are in place for smart growth in areas of the country (and areas within urban centres) where Whole Foods can be successful. Right here in Ottawa there are plans for a Whole Foods in the new Landsdowne development in the upscale Glebe area of the city. But ultimately Canada will be a tough grocery market to crack because Loblaw has been so good at incorporating many of Whole Foods’ brand qualities into its own stores. Case in point – the new Loblaws location within the former Maple Leaf Gardens in Toronto. Jaime described her experience in that “amusement park” of a grocery store – a very good thing. But more than location, the diversity of Loblaw’s product brands effectively capture all types of consumers. The PC brands (Blue Menu, Black label, No Name) target different consumers and the company’s commitment to sustainable fish, meat, and produce speaks to the heart of Millennials and other ethnical consumers everywhere. Add to the fact that they have a massive distribution and location advantage means that Loblaw is well positioned to capitalize on the emerging Millennial market. Customer service – Millennials don’t like line ups and we want a cart (or basket) when we arrive. When you’re as big as most Loblaws locations, size can overwhelm the little things. Choice – Despite the size of most stores, Loblaws has made the choice to limit national brands on its shelves in favour of its own PC brands. This could come back to haunt the company if consumers “switch” supermarkets for some of their preferred brands. Convenience – Despite being open 24 hours a day, there are times when I go into a store and the shelves are empty. There is no skim milk, the cereal I like is out, and the yogurt hasn’t been refilled. This really drives me crazy and is something that can really turn off Millennials to the point that I may shop elsewhere just on principle. Finally, as Millennials become the dominate consumer force in the grocery business, women will no longer be the primary grocery shoppers. Millennial men are more excited and interested in food than any generation before them. Retailers have to take this into account and modify the experience for male shoppers. 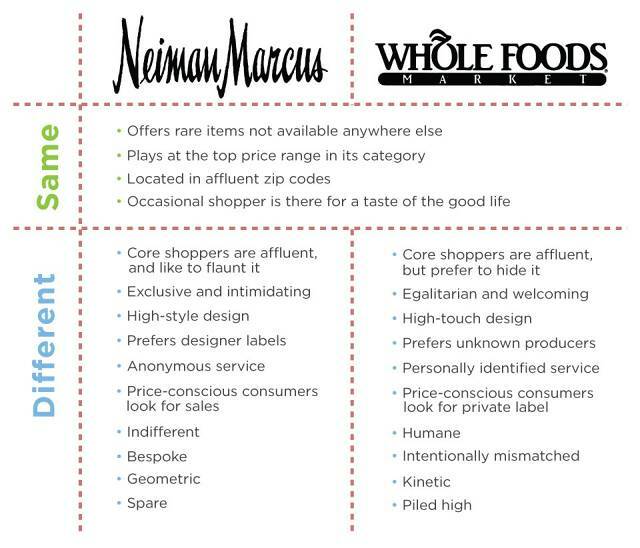 The graphic below describes Pavone’s comparison between luxury brands Neiman Marcus and Whole Foods.